Like Liaoning, Shandong has a ski jump. The nameplate accompanying the model cites a length of 315 m, width of 75 m, draft of 9 m, and cruising speed of 31 knots. CV17 is credited with a standard displacement of 65,000 tons and a full displacement of 80,000 tons. One curiosity in the CV17 model is its incorporation of both a ski-jump and two catapults. While certainly odd from a U.S. perspective, this is not completely outlandish. The Liaoning transformation period was a major challenge to install the huge new boilers and other heavy, large-scale replacement equipment. 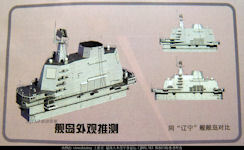 Liaoning ship's successor, the 001A, had a larger tonnage of the domestic aircraft carrier's overall design and construction, providing irreplaceable valuable experience. The domestic aircraft carrier core power, still used the same manufacturers of fine equipment, but more boilers, and more power. Modern aircraft carriers usually feature the bridge and chimneys on one side of the flight deck, which together resemble an island. However, comparing the island of this new carrier with that of the Liaoning, the island of the new carrier is noticeably smaller. During a CCTV interview September 08, 2016, military expert Cao Weidong said the construction photos make clear that the design of this carrier differs from the Liaoning in some key respects. Firstly, the new carrier boasts a smaller island, meaning that more space will be available for shipboard aircraft. Secondly, the performance of the carrier's new radar is superior to that of the Liaoning. Satellite imagery clearly shows, the 001A-type ship island has been shortened and narrowed. Even if the ship island is shortened by 5 meters, this is quite time-consuming and laborious. At the same time from the satellite imagery can also be seen, 001A-type deck has been optimized, with a small increase in available area. In addition, the internal structure optimization of the hull, such as hangar, ammunition fuel storage, cabin living conditions, compartment rationalization and so on. It can be said, compared to the external appearance, the internal changes may be greater. The installation of a another deck for the bridge provides a two-tier bridge. Compared to the original design of the bridge, there is a narrowing of the island while expanding the side of the bridge. With this design it is easier to observe the carrier aircraft take-off and deck ship Aircraft carrier use of the aviation bridge. It is worth mentioning that on the top of the ship island, large-scale active phased array radar layout changes the most from the positive layout into a diagonal arrangement of four sides. These improvements, the new aircraft carrier ship island is more compact, so that better protection of carrier-based fighter aircraft to better take off and landing security, and improve the operational efficiency of the deck. The 001A aircraft carrier pictures clearly show a total of 13 levels on the island, with control command rooms. The basic structure of 001A is a complete reproduction of the former Soviet Union in 1978 to complete the design of the "Marshal Kuznetsov " aircraft carrier. But the latter's navigation control room is only one layer. Like Liaoning, Shandong utilizes a STOBAR (Short Take-Off But Arrested Recovery) system. The bow ramp method of launching planes is a compromise. To take off in such a short distance without a steam or electromagnetic catapult, aircraft must minimize their takeoff weight. This limits the weapons and fuel they can carry, limiting their range and combat effectiveness. It also precludes using larger and slower propeller-driven aircraft [like the US Navy's E-2D Hawkeye] airborne early warning and control aircraft. The hangar design was changed, based on the overall military thought. The former Soviet navy in the center of the Kuznetsov-class ski-jump deck had huge SS-N-19 "Shipwreck" heavy anti-ship launchers. The missile launch magazine, in the process of transformation of the Varyag ship by China, was dismantled. 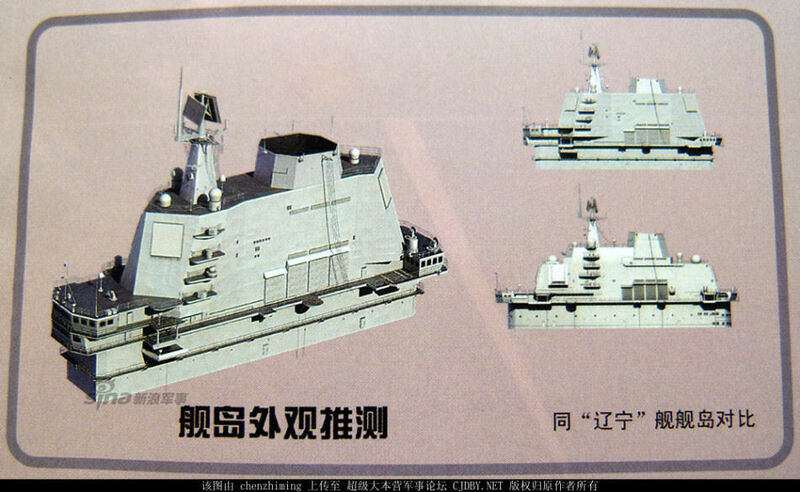 But limited by its original design, the Liaoning No. cannot have a huge space for the effective use of the hangar. The optimization of the 001A type was bound to make a major change to increase the hangar aircraft storage space and scheduling efficiency. The Liaoning air group was rather limited (30 machines officially) in relation to the tonnage of the ship (60,000 tons, compared with 32 aircraft and 40,000 tons for Charles de Gaulle). The ship was also not optimized initially for air operations, since it had to deal with a hybrid ship (cruiser / aircraft carrier) with two batteries with almost contradictory architectural solutions. The modification of the hangar also led to the adjustment of the internal cabins. The former Soviet Union did not attach much importance to the design of the personnel compartment. But the Chinese military paid more attention to the comfort of the accommodation cabin, as in recent years with the western ship design. So there was more attention to scientific planning in the cabin design with the 001A aircraft carrier. There are some invisible changes and upgrades, especially with electronic equipment. China's industrial capabilities, particularly in the electronics industry had already exceeded the capacity of the former Soviet Union and Russia. Reflected in the construction of ships, there is radar technology, electronic warfare equipment, advanced communications technology, data link and joint combat capability, as well as the integration of these subsystems integration and electromagnetic compatibility capabilities. These hidden improvements are reflected in the combat effectiveness that increased and enhanced combat strength. From the pictures, 001A and 052D missile destroyer have installed the same four active phased array radar, covering 360 degrees. In addition, from the pictures the 001A carrier deck longitudinal, horizontal welding state can be seen. Andrei Chang pointed out that the aircraft carrier deck plates, welding technique is quite difficult, the former Soviet Union and now India are facing enormous difficulties, only a few countries capable of producing special steels used in aircraft carrier deck. Continental Anshan Iron and Steel Group and Baosteel Group to the 001A aircraft carrier at the same time to provide plates. "The basic design of Marshal Kuznetsov was not fully demonstrated by the Soviet design bureau," he said. "He and the Russian aircraft carrier designers have discussed these issues countless times. The other party admitted that the argument was a very rush In the case of completion, because the Soviet Navy needs as soon as possible aircraft carrier.